Are you wondering how to use Twitter to grow your online influence? 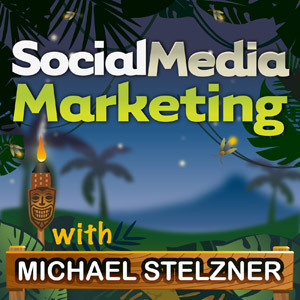 To learn how to best use Twitter for your business, I interview Joel Comm for this episode of the Social Media Marketing podcast. In this episode, I interview Joel Comm, author of numerous books including Twitter Power 2.0 and So, What Do You Do? He’s also the host of The Joel Comm Show, a business podcast. Joel shares how he uses Twitter to grow his platform. You’ll learn how to grow a quality Twitter following, and which types of content work best. Joel explains how he asks questions and helps people discover what their core is. This can include passions, talents, skills, abilities and personality, which are used to bring value to the world around them. This is how you find ultimate fulfillment. Listen to the show to find out the importance of starting a conversation. Joel explains how Twitter is still relevant. They have 200 million active users every day, which is really impressive when up against Facebook’s 1 billion–plus accounts. The thing that made Twitter cool in the first place is its simplicity. It remains relevant because it’s where people gather. Joel calls it the virtual water cooler. Twitter is where people gather. Twitter is a place for short conversations, which can be extremely powerful and relevant. Joel says that the water cooler strategy is to engage. You’ll find out the two different ways that Joel engages on Twitter and why significance is so important. The most essential part is to be authentic. You can connect in the moment, which can be greater than you might imagine. Joel describes how pictures are an excellent use of Twitter. He likes to tweet from Instagram and can post from his Instagram account to Facebook, Twitter, Tumblr and Foursquare, all at the same time. Twitter only allows 140 characters, so when you use pictures, it can be a lot of bonus words. Even mundane pictures can get a lot of interaction. Listen to the show to hear an example of a picture that Joel used that made him realize there’s a lot of power in mundane tweets. Joel has started to check out more of what people on his stream have to say and then reshares their content. He does this more than tweeting his own original content. It’s the giver mentality. A couple of Twitter’s strengths are the retweet and the favorite. They’re great opportunities to focus on the value that others bring. There are days when Joel doesn’t tweet at all. Other days, he can get 5 or 6 tweets in. It all depends on what’s happening that particular day. You should never just tweet for the sake of tweeting. When it comes to a tweeting strategy, you’ll discover why it’s important to be true to yourself and be aware of the types of businesses Twitter works best for. Listen to the show to find out why Joel generally uses the standard retweet over a customized retweet. Joel advises starting with absolutely nothing. If you are new on Twitter and don’t know where to begin, Joel recommends you start with a hashtag that is in an area of interest. The next step is to discover people who are talking about your personal or business interests. As entrepreneurs, there is typically an overlap of the two. Once you start to follow people, you can then bring value to the conversation either through a retweet or a reply. A great way to engage with people is to ask questions and then wait for the answer. When somebody posts a question that you think you can answer, go for it. A lot of people don’t stop to think about how they engage. To increase your follower base organically, you need to be able to relate to people and bring value to them. 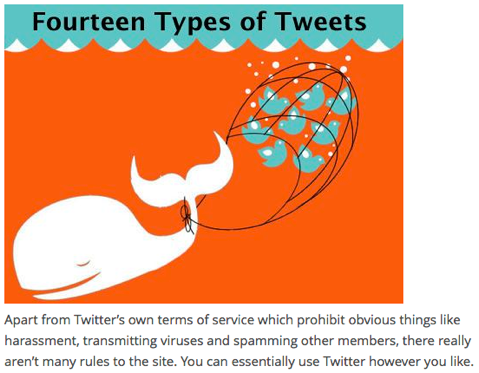 Back in June 2009, Joel wrote an article entitled “Fourteen Types of Tweets,” which explained the different ways to engage with people on Twitter. Joel describes how the hashtag drives search on Twitter. When you use a hashtag before a word or phrase, it gives a common base from which to look for content. Twitter is a 24-hour news outlet. The hashtag allows you to find content. Listen to the show to find out why Joel looks at Twitter as the biggest nonstop party. Joel explains why he doesn’t like to prescribe a single approach to using Twitter. When he first started out on Twitter, the mindset was to follow people back who followed you. It was the respectful thing to do. However, when Joel reached 70,000 followers, he soon discovered that Twitter became unusable. People you want to follow get lost in the shuffle. You’ll find out why Joel did something controversial in November 2009, and wrote a blog post about it. Joel went from following 70,000 people to 917. Joel explains that you should never use Twitter as a billboard. You need to engage with people on a human level and bring value. Listen to the show to discover how you can use Twitter to drive traffic back to your primary channel and why Joel thinks it’s a huge mistake to use third-party sites to build a platform. Joel explains that not only does he have a blog, he also has a number of websites. For example, Joel’s editor at WorldVillage finds infographics that are of interest to Joel, which then allows him to retweet them. 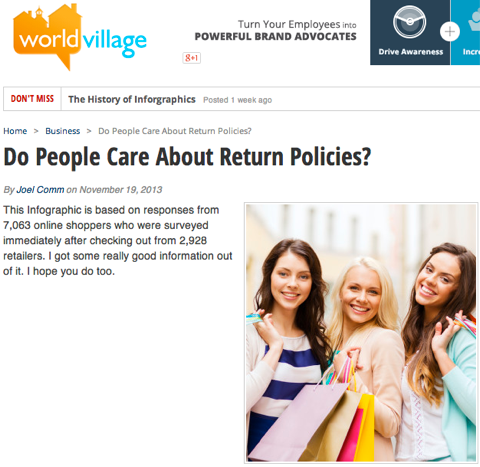 Joel retweets infographics from WorldVillage because it adds value for his followers. It’s content that he shares from one of his sites. The content doesn’t talk about him; it brings value to the conversation. If people find it of interest, they will ultimately end up on one of his sites. Listen to the show to find out how you can use Twitter to make the sales process easy. Joel is a big believer that you need to have consistent branding across all of your platforms. Twitter is unique in that it gives you more real estate to play with. You have your profile picture and the background, which allow you to do some clever things. Joel believes that as long as your profile works on the main Twitter app, then you’ll be OK for mobile, as Twitter will resize it for you. You’ll find out why it’s impossible to get your profile to work across all mobile apps. Listen to the show to find out the importance of having a good photograph and bio description to populate across every different Twitter client. Joel explains that when Klout first started, the advice was for you to connect your Twitter account with them and they would be the arbiters of how much social influence you had. Their algorithm will assign you a number between 0 and 100. It tells you how much influence you have for keywords and in niches and markets. Joel’s Klout score is 83. You’ll find out why most people thought it didn’t mean anything when it first came out and why Klout has now gone from saying “We are important” to actually being important. In today’s age of influence marketing, big brands want to find influential individuals who can share the brand’s message. Joel believes you will start to see more of this. You’ll hear how companies use Klout Perks to get influential people to talk about them in a positive way. Listen to the show to find out about what happens once you have connected your account. I’ve recently started to use my personal profile on YouTube and have discovered the YouTube Subscribe button. You can embed a YouTube Follow button directly onto your website and then with a click of the button, a blog reader can become a subscriber to your YouTube channel without leaving your blog/website. The button is very similar to the one you see that allows someone to become a one-click fan of a Facebook page or to become a follower of a LinkedIn page. It’s really cool. I suggest you go ahead and give it a try. People are coming from all over the world. At this year’s conference, people came from more than 31 countries and dozens of people came from Australia. Here are some of the countries that will be represented: Norway, United Arab Emirates, France, Germany, Australia, Denmark, Spain, Mexico, New Zealand, Ireland, Canada, India, Peru, Panama, Venezuela, Brazil and the UK. As you can see, this is truly a global conference. We are expecting to see 2000 marketers in San Diego, doing nothing but living and breathing social media and having a lot of fun and connecting with fellow marketers. So be sure to check it out. 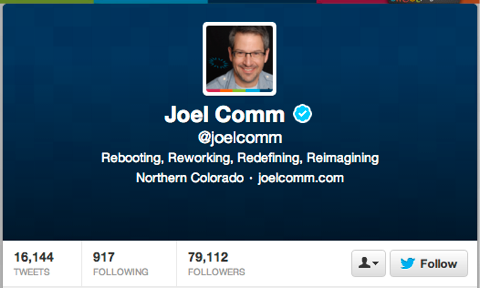 Connect with Joel Comm on his website, Twitter and LinkedIn. Listen to The Joel Comm Show. Check out Joel’s books: Twitter Power 2.0 and So, What Do You Do? Listen to the podcast with Ric Dragon, Social Media Science: How Behavior Impacts Social Media Marketing. Try TweetChat to see chatter around a particular hashtag. Read Joel’s articles: Fourteen Types of Tweets and I Purged My Twitter Account. Head over to WorldVillage to see the type of content Joel shares on Twitter. Discover more about Klout and Klout Perks. Try the YouTube Subscribe button on your blog/website to build your YouTube subscribers. What do you think? What are your thoughts on using Twitter to grow your influence? Please leave your comments below.